One of the main differences between restoring residential properties and commercial ones is the scope of the task at hand. Industrial properties tend to be larger which means you need a service with resources at its disposal to ensure satisfactory service. Our company is local but has access to national-scale resources which allow us to respond quickly; We're Faster To Any Size Disaster. We operate a specialized unit for commercial flood damage in Chandler that is capable of performing emergency repairs. Each team is headed by a project manager or dedicated crew chief with qualifications in water restoration awarded by the IICRC, plus many more capacities. When you contact us, we can arrange for a team of technicians to be sent to your location and begin mitigating against further damages. It is not uncommon for flood situations to bring in unwanted debris as well as water, mainly if the cause is a natural weather event. It always seems like Monsoon Season. Our team can help to prepare a job site for our construction contractors while performing vital mitigation tasks that could prevent on-going damages. We can also board up the property to secure the property, restore power and remove potential safety hazards. Ask us about our ERP Program, the Emergency READY Profile, to help prevent and to mitigate emergency incidents from water, mold, and fire. Our business is to keep you in business. In all flood sites, the most crucial step is to remove standing water, if present. Prolonged exposure can cause structural damage. When natural materials are involved there is a high risk of them absorbing moisture and expanding or becoming hotbeds for microbial growth. SERVPRO uses industrial pumps to remove excess water as well as proper drying techniques to restore the structure to a state of equilibrium; 12% moisture content or less. This may mean the demolition of non-salvageable building materials. Where flooding has been caused by backed up sewer points or road overflow, there is a strong chance of Biohazardous waste being present. SERVPRO can enter a property, remove and dispose of the offending substances before thoroughly disinfecting and deodorizing the affected zone. This process can be invaluable to properties that require structural remodeling, as it allows our rebuild contractors to enter the site promptly. 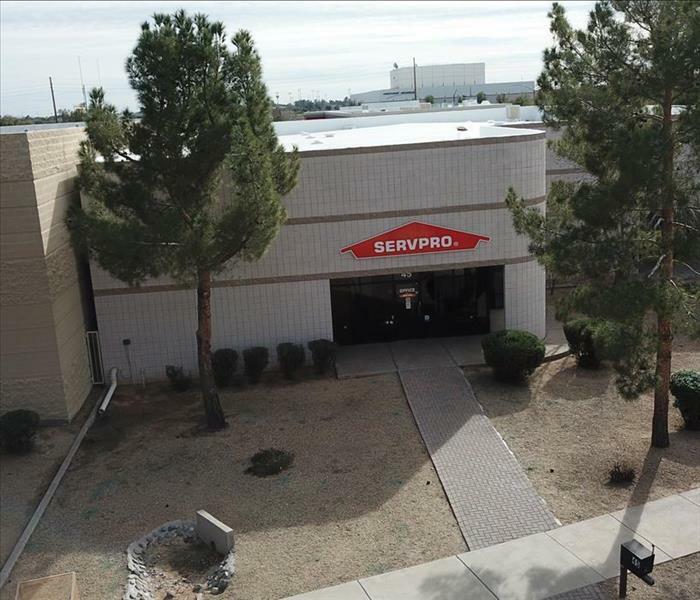 A commercial property requires greater resources to overcome damages, contact SERVPRO of Chandler South at (480) 895-4670 for a one-stop mitigation experience--from cleanup through to full reconstruction. Local weather can prepare your business for possible flooding, click here. One of the key advantages we have when handling water damage in Chandler is our team of highly-trained restoration professionals. Every SERVPRO technician undergoes months of intensive training in multiple disciplines of home damage mitigation and restoration before receiving further on-the-ground advice from senior employees. The average team we send out to local homes carries years of experience and in-depth training with some of the most advanced technology in the industry. Most SERVPRO technician receives multiple IICRC certifications to help them deal with issues such as water damage in places like Chandler. These certifications are tested and renewed regularly to ensure that we perform well to a national standard. Beyond that, our initial Employee Certification Training Program, ECTP provides the basics for opportunities for technicians to become specialists that can handle many different aspects of a specific type of damage. Our constant cycle of training and education ensures that we maintain readiness for even the most severe damage calls we receive. We offer CE Continuing Education courses also for ancillary professionals in real estate and insurance to help them better understand the requirements for successful water damage cleanup and restoration. SERVPRO of Chandler South is a locally owned and operated damage mitigation and restoration service with national resources for training and equipment. Call us for help 24/7 at (480) 895-4670. Plenty of Parks to enjoy here. As the monsoon season approaches in Chandler, you would be well-advised to start taking steps to protect your home and belongings before heavy rains hit. What might be a small leak now could lead to significant damage once powerful winds and rain start to batter your home exterior. SERVPRO stands ready to help when preventative efforts fail and your home starts to sustain damage, but a call to us can be avoided entirely with the appropriate preparations, hopefully. The Chandler monsoon season can cause significant damage to your home if you are unprepared. Water can come into the home through exterior leaks, windows, and doors left open for the storm, and more rarely, through flash flooding. We find that quite often we must place tarps over wind-damaged roofs to mitigate the water and wind damages. Large-scale flooding can cause massive damage to the entire home and requires a professional damage mitigation company like SERVPRO to both dry the place out and ensure that no safety issues arise in the form of structural damage or mold growth. Smaller issues such as leaks or localized flooding can be dealt with through much less intensive restoration work, but can still cause permanent damages if handled by an unqualified person or company. Preventing damage from the monsoon season is, for the most part, a simple task. Finding cracks and holes in your exterior and patching them up can prevent water from seeping in through these portals. It may be challenging to identify exterior leaks and holes during the dry season that comes before the monsoons, but taking a quick look around the house to identify any potential problems could be worth your time. Once the structural integrity of your home has been ensured, just try to keep windows and doors closed on days with a chance of rain. Sounds simple, and it is. But, you know that we are here to help if needed. SERVPRO of Chandler South provides expert damage mitigation and restoration services for local homeowners in need of help. Call us 24/7 at (480) 895-4670. 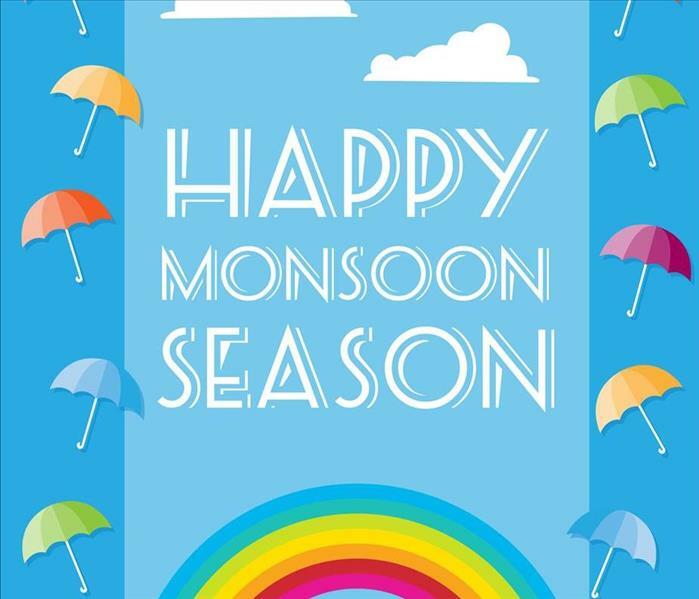 More about Monsoon Season here. Standing water needs to be removed as quickly as possible to avoid potential permanent damages. Many fabrics are significantly weaker when wet, up to 50% in some situations, which require the care and attention of a professional service. Flooding scenarios are prevalent in commercial industries where plumbing often works harder than in residential properties. We offer an honest, professional service for businesses in need of commercial water removal in Chandler. Our experience is an essential asset to this community, continuing to inform our approach and method. Our emergency lines are available 24-hours a day with rapid response units on call to help mitigate losses in your place of work. In water restoration, proper drying methods are essential to removing unpleasant odors, mitigating permanent damages and preventing an issue from becoming severe. When standing water rises above two inches, we can deploy gas-powered pumps. This equipment can transport water via a hose to a nearby open sewer point and can remove large amounts of water in a short period. Once the majority of moisture has been removed your SERVPRO technician can make assessments on the breadth and scale of damage. This assessment involves checking the subfloor to see how far the moisture has been absorbed below the surface. Subflooring constructed from sheathing and wooden trusses often weaken once they come into contact with moisture. Minimizing damage, both initial and secondary to structural elements, and to inventory, can get the business operational quickly. 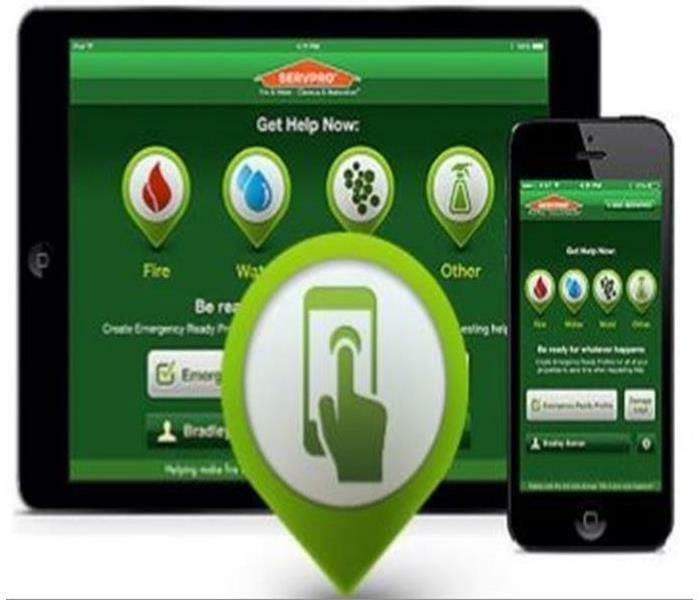 SERVPRO understands that it is our business to keep you in business. Once carpets, fabrics, and furnishings have been removed, SERVPRO can dry residual moisture using industrial water extractors. Wall cavities or fittings can be drilled into to circulate air inside walls and prevent damp spots from causing problems further down the line. Most equipment used to dry combines heating elements and airflow. This process naturally raises humidity levels which we can control using dehumidifiers or establishing an open system ventilation method in the affected area. Our drying methods have been honed over years of working in commercial properties. Contact SERVPRO of Chandler South at (480) 895-4670 for immediate assistance. Welcome to our city by clicking here. It is no secret that flood damage in Chandler can have long-term effects on your home. Without a professional damage restoration company like SERVPRO, water can soak into the materials that make up your home and cause permanent damages that may require expensive reconstruction work to fix. Calling us in early helps you to avoid many of these problems thanks to our rapid drying capabilities and an extensive array of specialized tools and equipment. Some of the more severe potential consequences of flood damage to Chandler homes involve structural damage. Water can, over time, create cracks and oxidation in structural components of your home, potentially creating dangerous situations that can be very expensive to repair. Even if water never reaches the building foundation or supports, it can still cause permanent damage to your floor and interior walls, leaving visible scars on your home. We dry out the area quickly and implement early restorative procedures to solve problems before they can grow and multiply. Then there is the problem that flooding from groundwater is considered Black Water, contaminated with various pathogens, chemicals, pesticides, sewage, and other elements that harbor potentially dangerous microorganisms. SERVPRO techs can disinfect affected areas and components with biocides. SERVPRO of Chandler South is a locally owned and operated professional damage restoration service. Call us in to help take care of flood damage in your home at (480) 895-4670. 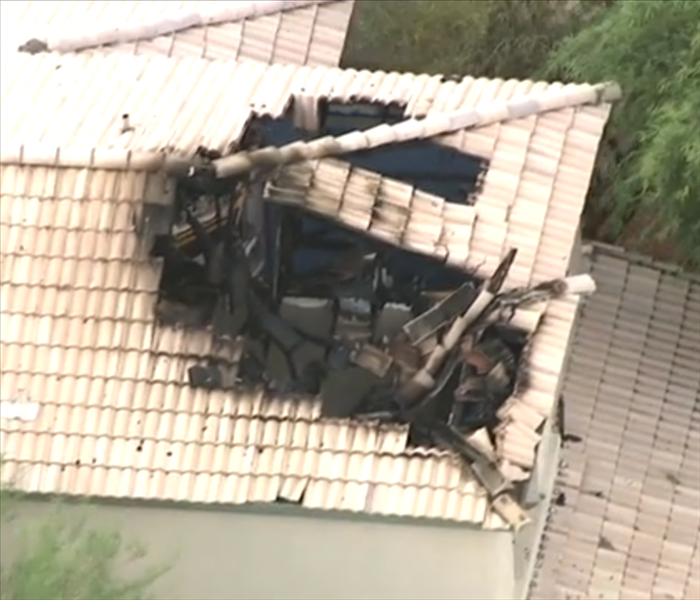 Some severe cases of fire damage in Chandler can require a temporary move-out of both residents and their belongings from a home. While these move-outs help damage restoration companies like SERVPRO to access and treat the damages with maximum efficiency, they can also be costly and tough to go through. In general, we only recommend move-outs for the most extensive cases of fire damage we see in Chandler. Most fires stay localized to a small part of the home, and their damages can be handled without cutting off access to other rooms. In some cases, such as for a small kitchen fire, you may be able to continue using most parts of the same room that had the fire. We can use plastic sheeting to isolate affected areas during cleanup and allowing other zones to be available for normal use. When move-outs do become necessary, we work with you to identify which items should leave or stay in the area. We do stringent inventory control using our CCIS form and can tag and also scan items. This simplifies the insurance claims paperwork and also monitors your belongings. For off-site cleaning at our facilities, we can safely clean and salvage many hard and soft belongings that our customers felt were beyond help. SERVPRO can help! Our priority is to make the restoration process as fast and easy as possible. Our technicians and estimators have years of experience handling fire damages and can provide expert advice on how you should proceed with a move-out. SERVPRO of Chandler South has years of experience taking care of many types of fire damage in local homes. Call us at (480) 895-4670. We know fire damage in your Chandler home or business can be an overwhelming experience. Treating the aftereffects of fire requires a multilayered approach to ensure the premises is clean and hygienic. When SERVPRO receives the initial call, we respond with professionalism and compassion to your circumstances. 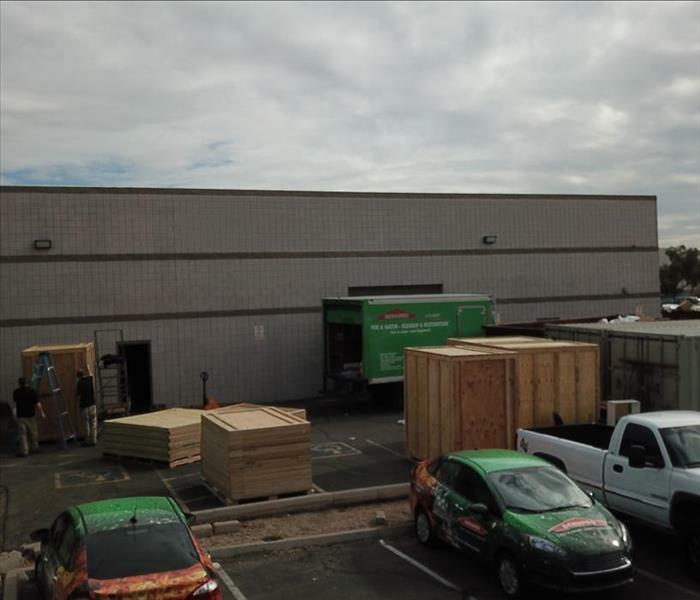 SERVPRO of Chandler South fire damage restoration technicians are IICRC-certified Fire and Smoke Restoration specialists and can deal with all levels of remediation for fire damage in the Chandler, AZ area. Even a small fire started from a momentarily forgotten hot pan on a stove can leave significant issues to clean up, and if not handled properly, the potential for secondary damages such as foul odors and even mold can affect the property. We have the equipment and expertise to deal with any size fire disaster in a residential or commercial property. 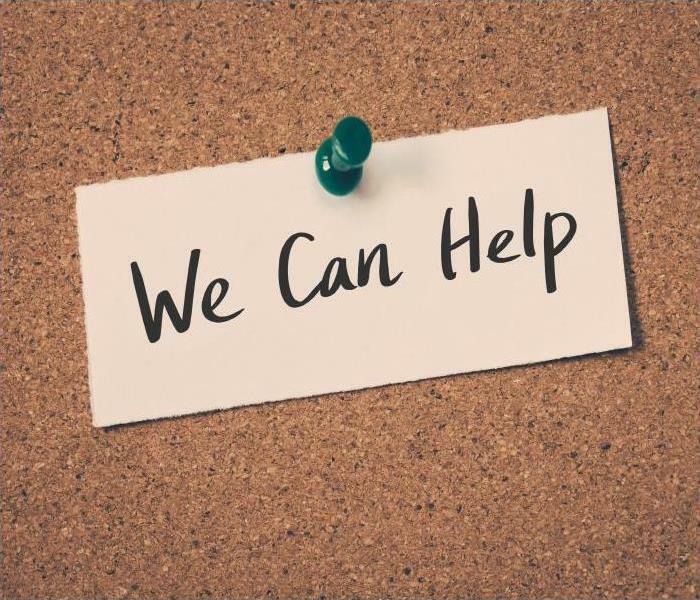 Our emergency response team arrives on site within hours after your initial call; in the meantime, there are things property owners can do to minimize the spread of fire damage in the home or business. Only remain in the property if the fire department has ascertained it is safe for you to do so. Safety for all is a priority. If you remain in the property, avoid fire-damaged areas to limit the spread and the probability of soot particles being embedded into furnishings, window treatments, and carpeting. Do not attempt any cleanup of walls or fire-damaged objects. If the fire was located in a section of a home or business, containment steps are taken to diminish the spread of soot and smoke odors to unaffected areas. Our SERVPRO technicians inspect the area and determine if there are damages that require immediate attention such as boarding up windows and walls or placing tarps over compromised roofing. Rooms may be sectioned off using poly-barriers to isolate odors and floating smoke and soot particles. 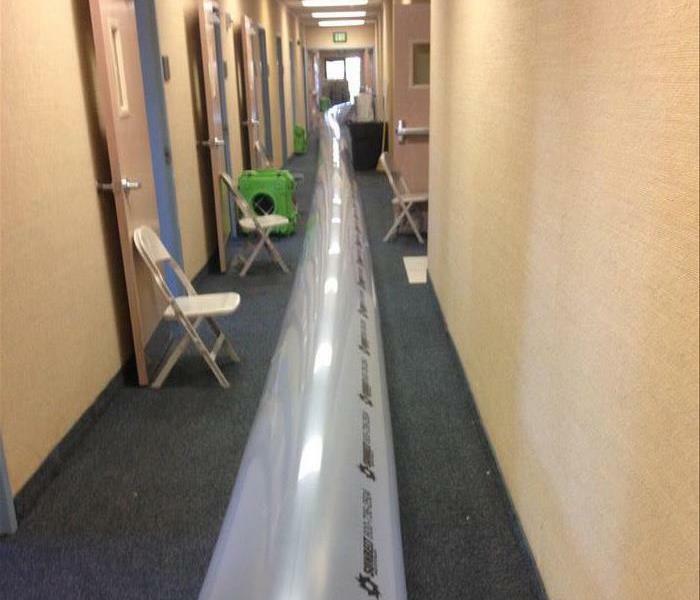 It is not uncommon for SERVPRO technicians to work in teams. While one team works on identifying building materials and items too charred for restoration and suggests removal, other technicians focus on identifying water damage from fire extinguishing efforts. The restoration process is communicated transparently with both the owner and adjuster at every step and no discarding of items is done without approval. Water cleanup is vital to the success of the remediation process. Extraction of any remaining standing water is performed using portable pumps or truck mounted units in the case of large-scale fire loss cleanups. Moisture meters and thermal imaging are used to determine if there are any pockets of moisture under flooring or behind walls. SERVPRO of Chandler South technicians work diligently to ensure that mold is not an issue. Because of the residual moisture that can be left after extinguishing a fire from firefighters' hoses or a sprinkler system, multiple readings are taking before, during and after the drying process to ensure the moisture levels are consistent with our drying goals. This baseline reading goal when achieved can help to prevent mold development. This technique along with thorough cleaning with antifungal solutions leave surfaces clean.. Residual moisture can cause a host of secondary issues including both mold and foul odors. Thorough drying is the key to significantly reducing this possibility. 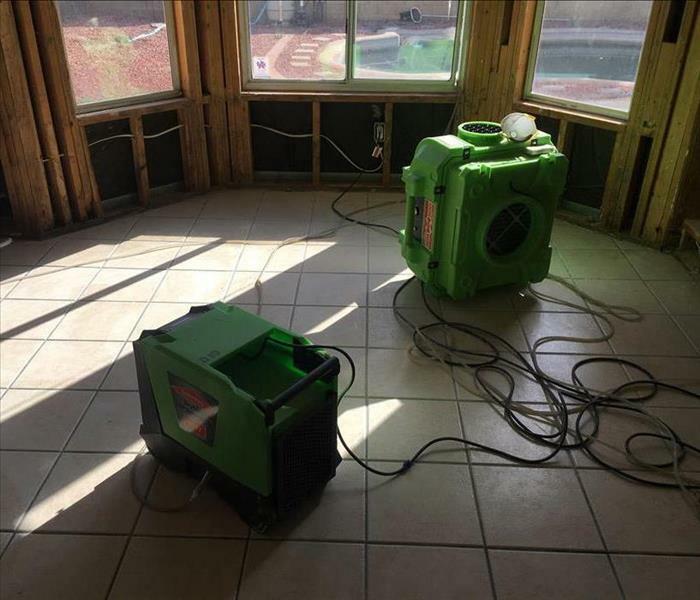 The drying set up is unique to each cleanup and restoration SERVPRO works on. Using psychrometric principles, or the study of air and moisture, they position the air movers to keep moist air away from surfaces and pull moisture up and out of walls, ceilings, and flooring, then dehumidifiers capture and remove it. This is a very efficient way to dry affected areas quickly. There is not a one-size-fits-all process for cleaning smoke. SERVPRO technicians choose from different types of cleaning depending on the type of materials burned in the fire. Synthetic materials tend to leave a greasy residue that smears and sticks more to surfaces. Organic materials such as wood tend to leave a lighter, easier to clean smoke residue on surfaces. Dry ashes can readily be vacuumed up as an initial step in the fire debris removal process. Soot and smoke generally do not travel deeply into nonporous surfaces such as enamel painted walls or vinyl wall coverings. While synthetic materials tend to attract more smoke and soot, the tradeoff is that they generally are easier to wipe down. That is why along with our professionally-formulated cleaning solutions, we use both wet and dry sponge methods as needed. Odor-causing soot molecules can travel throughout the area on shoes, set on the rims on jars of food and through the HVAC system. Because they are smaller than the average human eye can see (around 40 microns), containment is an early part of the cleaning process. SERVPRO has various types of specialized equipment for cleaning soot from the property. The HEPA air scrubber is a machine frequently used to capture motes as small as 0.3 microns. The air scrubber pulls in the air in the same method as a vacuum and is fitted with a HEPA filter to capture the tiny soot particles. Because air flows from high pressure to low-pressure areas, using negative air fans creates an inward airflow direction directed through a duct and stops airborne soot particles from escaping or spreading. Any smoke odors left behind may be handled through thermal fogging or the use of ozone machines, in extreme cases, for neutralizing unpleasant scents. 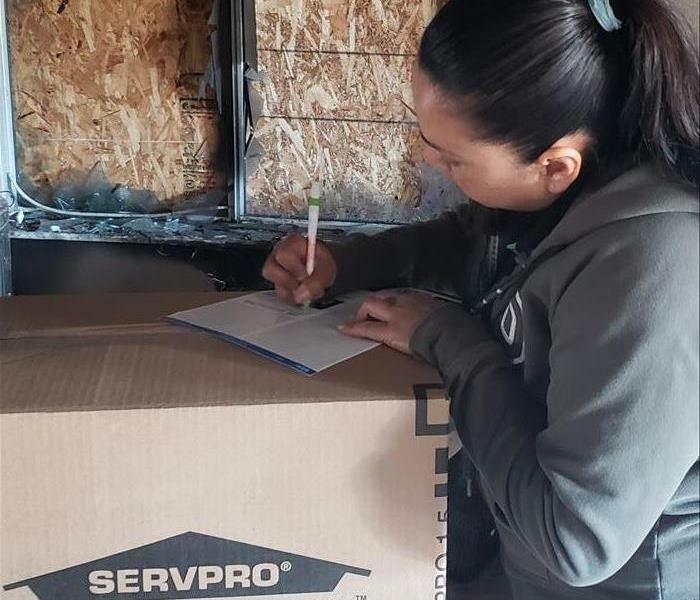 Once the cleanup has been completed and restorable items in the structure returned to their -pre-fire condition, SERVPRO can recommend the necessary repairs to complete the process. It may be minor tasks such as replacing damaged drywall that was removed due to charring, installing new carpeting or painting walls. Our technicians can also handle major construction needs such as rebuilding a room or commercial property. SERVPRO of Chandler South is available 24/7 to handle fire damage to your home or commercial property. Our technicians arrive within hours and have the expertise and equipment to handle the restoration of your home or business from start to finish. "Like it never even happened." Read about fire prevention from the Chandler, AZ Fire Department. If you need our help in your property, call today at (480) 895-4670 to get started. Chandler residents get to enjoy the slower pace of their community, but still have quick access to nearby, larger cities and the Ahwatukee Foothills. While the risk of disaster is still present, storm flooding is rarer than water spilling across the living room carpet from a rusted out water heater or another plumbing problem. To eliminate water damage from Chandler homes, SERVPRO restoration specialists first stop the source of the problem. Our personnel shut off the water to the plumbing issue or stop it at the inlet pipe if needed. Once stopped, specialists can repair minor issues like loose or broken connections and replace items like a broken sink. For major issues, our team leaders always recommend the homeowner bring in a licensed plumber. As team members make repairs, other SERVPRO professionals begin removing any standing water. If the level is more than around ankle-deep, they start with one of the commercial grade pumps from our equipment inventory. Once the water is too low for the pumps to function properly, they switch to smaller extraction devices that can pull water off concrete and out of wood floors and carpets. After drawing water out of the carpets, specialists next detach the carpet from its tack strips, roll it up and put it aside. Team members then remove the carpet pad for disposal. Pads crumble quickly and are cheaper to replace than to expend the labor costs attempting restoration. With the pad gone, they roll the carpet back out and use an air mover to force warm, dry air under and over the carpet while an exhaust fan at the opposite end draws out the remaining moisture to effectively dry it without causing any secondary damage. These initial efforts by SERVPRO of Chandler South serve to eliminate water inside area homes and begin the restoration process. If you need our help in your property, call today at (480) 895-4670 to get started. Click here for more about Chandler. Professional services are key to proper remediation after flooding. Contact SERVPRO for flood damage remediation services. Flooding is something that affects Gilbert homes more often that many homeowners would care to believe. With storm damages that can penetrate roofs, siding, windows, and affect other portions of your exterior defenses, a vulnerability could allow floodwater to get into your home unabated. With this emergency, you need the expertise of our rapid response team. We remain available at a moment’s notice, 24-hours a day, to offer every customer the effective mitigation and restoration practices their property needs when disaster strikes. While our team might rely heavily on our industry-leading equipment when flood damage occurs in your Gilbert home, we also have expertise and experience to begin effective practices that can also help to preserve greater portions of your damaged property in these often detrimental circumstances. With our fast arrival, our SERVPRO team can set up containment to prevent the spread of the damage from getting any worse while our estimator and management assess the full scope of the effects to the property. Drywall and flooring can both take the largest share of the damage from flooding, as water tends to collect on flooring materials and pool alongside the walls. While in many cases, flooring materials can get thoroughly dried and restored with the right response from our professionals, drywall is not always so fortunate. As a porous building material, sheetrock can prove highly absorbent for floodwaters, allowing moisture to wick far above the baseboards. Our controlled demolition techniques by our SERVPRO contractors can remove just the damaged portions of drywall through a process called flood cuts. This practice can help our professionals to gain access to wall cavities with our high-velocity air movers and other drying equipment, but also allows the reconstruction and build back process to follow to be much more efficient. 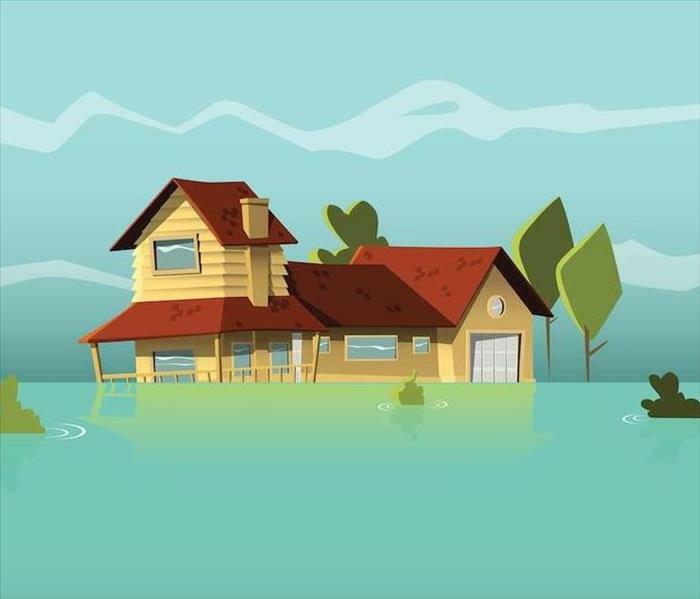 With so many materials and areas that can get affected by spreading floodwater, having effective and efficient mitigation work start immediately is critical to protecting your property. Our SERVPRO of Chandler South rapid response team can make it “Like it never even happened.” Give us a call anytime at (480) 895-4670.